I’ve been looking back through my cycling logs to have a look at previous seasons. I must admit I did think quite a bit about what happened in previous national championships and why I was just outside the podium on several occasions. This is a potted history of the past 9 national championships. 2004 – My 1st season racing. 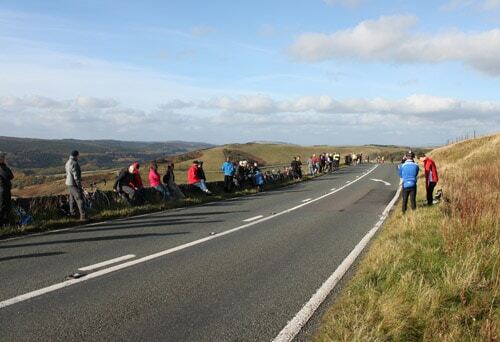 My first open was a Cardiff Byways triple hill climb. (3 hill climbs in one day. I finished 2nd out of 11 – a good experience, though I’ve never been back!). I also came second in Burrington Combe (Bristol South CC), with a time of 7.10. I haven’t often beaten that initial time. 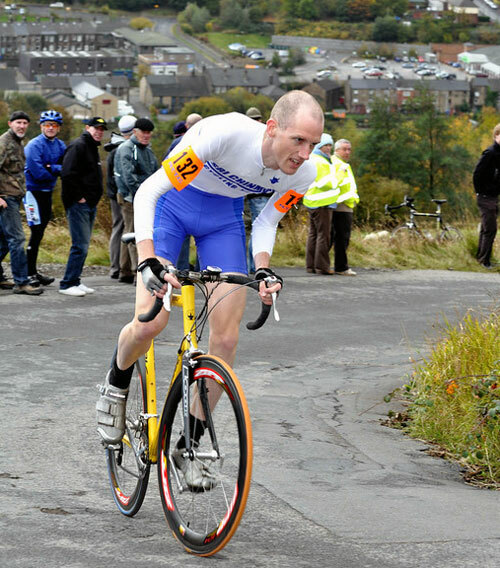 In retrospect it’s a shame I didn’t go up to north east for National champs it was won by Jonathan Dayus just ahead of James Dobbin on Winter’s Gibbet a fairly long climb. 2006 – 7th (5.18) Peak Hill – 11 seconds behind 3rd, 36 secs behind 1st – Devon. I did little racing in 2006. I few slow 10 mile TTs. so I was pleased to finish 7th, only a few seconds off the podium. I thought if I can keep improving at this rate, I could get on the podium quite soon. James Dobbin was a standout winner from David Clarke. Peak hill was a great hill, flat at the bottom getting steeper and steeper. I remember it was a beautiful warm sunny day. 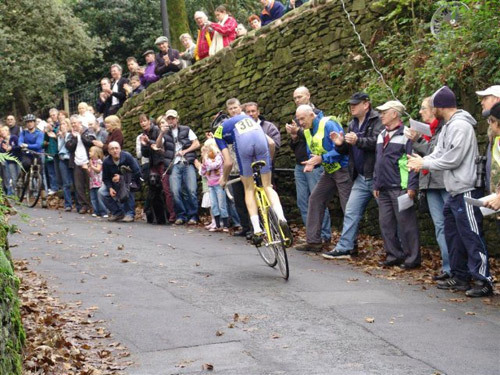 Blog on 2006 national hill climb. 2009 – 12th (3.49) – Pea Royd Lane, Stocksbridge. 10 secs behind 3rd, 32 secs behind 1st. 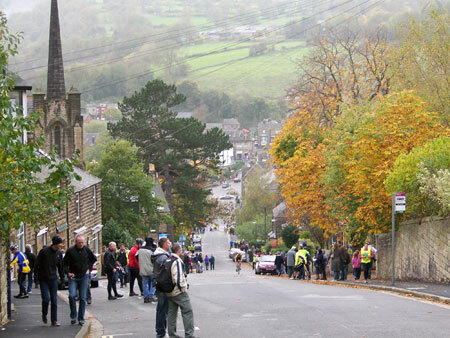 A steep classic hill climb in the environs of Stocksbridge. I had a reasonable race and almost collapsed at the finish. I was able to see the winner – Dan Fleeman grovel his way to the finish after completely smashing it on the lower slopes. He did 3.19 over 10 seconds ahead of 2nd place Matt Clinton. It was a real class ride by Fleeman – a week after finishing in the top 20 at the Tour of Lombardy. Blog of 2009. 2012 – 12th (2.41) – Rake – 12 seconds behind 3rd, 20 seconds behind 1st. This was the first time I’d been dissappointed with my ride in a national. Despite knowing the Rake wouldn’t suit me, I really went all out for preparation. I rode the hill twice in training, and did a reasonably good time of 2.35 (tailwind assisted) I’d also spent a lot of money on lightweight equipment hoping this would make the difference. On the day, I wanted to do something to go quicker than my times in training. I hoped that the crowd and national atmosphere would give that extra lift to raise my performance and slip under 2.30. I reckoned a sub 2.30 time would have a good chance of a medal, so all I needed was an extra 5 seconds compared to the practise run. The previous year, I’d had a chat with a former good rider about riding the Rake, he said that if you ride gears you’ve got to be strict and only change down one gear for the steep bit. I thought this would be the secret of getting those extra 5 seconds. I started off fast and as the steep section loomed, I just made one late change downwards. But, as soon as the road reared up, I felt like treading treacle, I was pushing a huge gear and low cadence. But, I was stuck in the mindset of not changing down a gear. I just tried to push. I was riding differently to how I had in training and usually tackled hills. Eventually, I had to make a messy change down on the steepest 25% section (something you shouldn’t do) I then tried picking up the pace. I was exhausted at the top, but knew I hadn’t got the best out of the ride. I found my time was 2.41 slower than in training! It was wet and headwind compared with tailwind, but it wasn’t the national experience I was wanting. I finished 12th – same position and slower than my first national in 2005. My disappointment was masked by the fact, I wasn’t really in with a chance for medals anyway. I lost a few second due to poor hill climb technique. But, it was the difference between perhaps 7th and 12th. It was a rather painful lesson not to try something completely new in the big race. If I had kept the same approach as the training run, I would probably have done better. I really needed more practise runs. But, again the season was a story of 10 wins out of 12, but not doing anything at the national championships. (significantly, the only other race I’d lost was similar 2 minute effort on Streatley hill where I finished 6 seconds behind Robert Gough. A similar result happened on the Rake. 2014 – 4th (3.32) 4- seconds off the podium. A bittersweet event. It was a great achievement to go faster than in 2008 (3.49). I trained really hard, but back in the grove of just missing out on the podium. A second fourth place! It was a fairly consistent average of 7-9 seconds behind the podium place for 10 national championships, apart from 2013.